These two of several email exchanges between Federal Transit Administration about the city’s plan to construct a $5.3 billion, 20-mile elevated steel on steel rail project from Kapolei to Honolulu, highlighted today by former Gov. 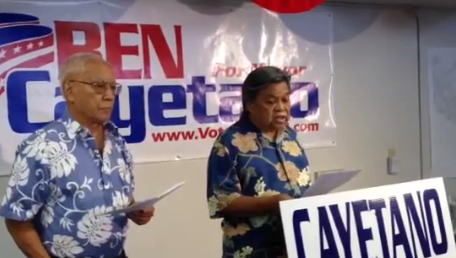 Benjamin Cayetano and former City Council Chair and Retired Judge Walter Heen. The emails surfaced this week after Cayetano, Heen and five other plaintiffs filed a lawsuit against the City & County of Honolulu and the Federal Transit Authority over the city’s Environmental Impact Statement (EIS) for the project. The government agency had to release the emails in the discovery process. “This is the most mismanaged project in 28 years of office,” Cayetano said today after reading several of the emails to the media. He is running for mayor in 2012, and critical of how his opponents, Honolulu Mayor Peter Carlisle, and former city Managing Director Kirk Caldwell, managed the project. Like Cayetano and Heen, HonoluluTraffic.com founder Cliff Slater, University of Hawaii Law Professor Randall Roth, Sen. Sam Slom’s Small Business Hawaii Education Foundation, Dr. Michael Uechi and Hawaii’s Thousand Friends, the five other plaintiffs in the lawsuit filed last Spring, adamantly disagree that the heavy rail technology is the most environmentally friendly transportation alternative for Honolulu. The emails that document a number of disagreements between FTA and city officials over the city’s rail plan were buried in 155,000 pages of administrative record. The Administrative Record obtained by the plaintiffs also revealed that the $15 million change order was authorized on October 5, 2011 by then-HART interim director Toru Hamayasu who, along with other HART members, kept the information from the public until it was uncovered by Star Advertiser reporter Kevin Dayton on January 25, 2012, Cayetano said. Neither the city administration nor the Honolulu Authority for Rapid Transit issued a response to the FTA’s criticism detailed in emails between 2006 and 2010, or comments by Heen and Cayetano. And their comment in the Record of Decision that, “Many commenters [on the Draft EIS] reiterated their concern that the Project will not relieve highway congestion in Honolulu. FTA agrees, but the purpose of the Project is to provide an alternative to the use of congested highways for many travelers.” (http://www.honolulutraffic.com/Total_ROD.pdf p. 208 of 217). “This is the kind of doublespeak that Honolulu voters have come to expect from both the City and the FTA,” Slater said. With 155,000 emails and other documents to review, Slater is optimistic more contentious emails will be uncovered. “We’ve only just begun to review the correspondence, and Lord only knows what else we will find,” Slater said.